Responding to a lawsuit filed recently by the ACLU of Washington, on August 15 the Pasco City Council approved the submission of a consent decree to the federal court agreeing that Pasco’s at-large system for City Council elections violates the Voting Rights Act. “We are very pleased that the Pasco City Council has recognized that their current election system violates federal law. 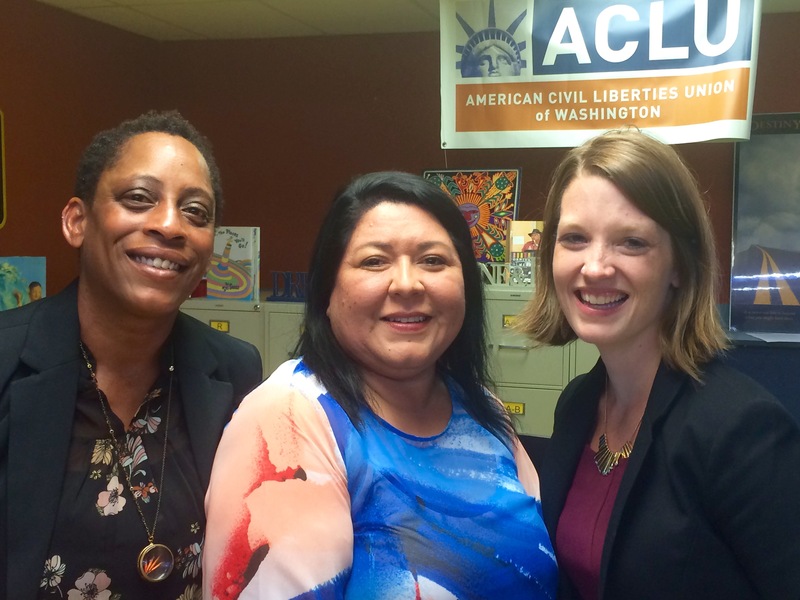 We look forward to working with Pasco officials to ensure that the new elections system will actually provide the Latino community a meaningful voice in the City Council elections,” said La Rond Baker, ACLU-WA Staff Attorney. Pasco and the ACLU-WA will now attempt to agree upon a common election system, keeping in mind the requirements of the Voting Rights Act. If they cannot, the matter will return to the Court, which will decide what system best comports with the law. The ACLU maintains that any acceptable solution must incorporate seven single-member districts. on behalf of Bertha Aranda Glatt, a Pasco resident since she was four, challenging Pasco’s at-large election system for violating the Voting Rights Act. The lawsuit says the election system violates Section 2 of the Act because it impermissibly dilutes the Latino vote, deprives Latinos of an equal opportunity to elect representatives of their choice, and does not allow the city’s Latino residents to participate equally in the political process. Although five candidates are nominated in districts and two candidates are nominated at-large in the primary election, all members of the Pasco City Council are elected at-large in the November election, i.e. every voter in the city casts their vote for each council member whether or not they live in the council member’s district. Because of racially polarized bloc voting patterns, the at-large election system impermissibly dilutes the Latino community’s voting power. It does so by requiring a candidate to win the majority of all Pasco voters in order to win a seat on the Council, which has proven impossible for the Latino community to do. Although Latino residents comprise 54% of Pasco’s population, Latinos comprise approximately 32% of its voting-age population. Because of racially polarized bloc voting, even though a Latino/a has run for a City Council position nearly every election cycle since 1990, no Latino candidate has ever won a contested election for a seat on the City Council. The suit points out that polarized voting patterns in at-large elections in Pasco have allowed elected officials to remain unresponsive to the needs of the city’s Latino community without fear of consequence at the polls. “I’ve lived in Pasco my whole life and am so excited to see that the Latino community finally be able to elect someone to the City Council to represent their interests in local government. This is a big step forward, and I hope that when deciding what election system to implement the City will keep in mind that all voices of the community need to be represented on the city council,” said Bertha Aranda Glatt. “We hope that the City will take this opportunity to adopt a seven single-member district plan as we believe this is the only way to comply with the Voting Rights Act and ensure that all of Pasco’s residents have a say in their government and their needs represented.” Breanne Schuster, ACLU-WA Staff Attorney. Representing the plaintiffs are ACLU-WA staff attorneys Emily Chiang, La Rond Baker, and Breanne Schuster; and ACLU-WA cooperating attorney Brendan V. Monahan of Stokes Lawrence Velikanje Moore & Shore.